Cut triplex into 6 pieces, each 44″ long. Divide into 2 groups of 3 pieces each. Starting 4″ from the top, braid the cords together, leaving 4″ from the bottom. NOTE: Use the clothes pins to hold ends together while braiding them. Keeping the braid flat, bend at the middle and form braid into a heart shape coming together at the middle point where braids end. Leave the 4″ of unbraided cord hanging down in the middle of the heart. Using the floral wire, secure braided ends together. Unwind the triplex cord hanging free and then partially untwist several of the individual pieces. Choose a 1 yard piece of Am-Twist paper that matches one of the colors in the Triplex. Make a double loop bow by first making a loop on one end about 4″, twist paper once, then make a 4″ loop on opposite side. Repeat this again making the loops slightly smaller. Wrap remaining end around both sets of loops at the middle. 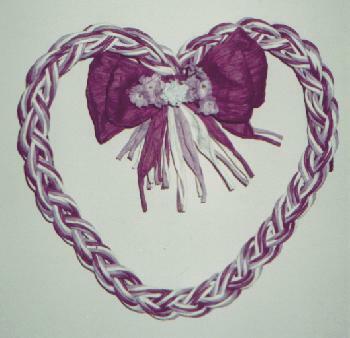 Glue the bow onto the heart over the floral wire. If desired, accent bow with small flowers or baby’s breath. NOTE: Am-Twist paper covered soft wire may be substituted for triplex. Multiply needed yardage by 3.